Next time Mum says use the new hot water bottle and not the old one, that is brittle, you might listen if it means not waking up to a burst water bottle at 1am! There are great things about winter and that is being warm and cosy and once that is achieved there is nothing nicer. However, when we go from being toasty to being freezing that is not nice! The story I heard, in the 1am case, was not dangerous because the water was cold by this stage, however, if hot water was in the bottle this could have been more serious. 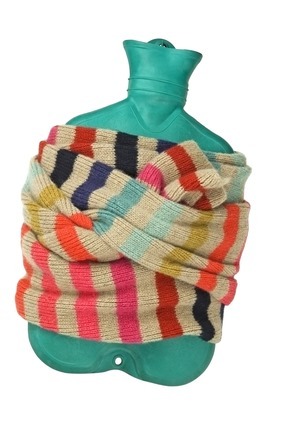 Putting boiling water in a hot water bottle is not safe and as another precaution wrapping the hot water bottle in a pillow case is a good idea. I think this extra layer just helps if there is an eruption! Some people use electric blankets and these can be safely used to warm up the bed, however, turning them off once in bed, is the safest way. And another way is to layer yourself in clothes and the bed in blankets. It doesn’t take long to warm up the bed this way. And of course human contact is another pleasant way to be warm and snuggly. It’s men who prefer cuddling in bed?